Home / news / rumour / What is the Sony ICX-1291 and ICX-1300? While browsing the Bluetooth cert pages for info on the new WH-1000M3, I ran into these 2 new portable audio player models. There appears to be 2 different models, the ICX-1291 and ICX-1300. So what could these be? At this moment in time I do not have that information but a guess is that one of those is the new NW-A50 walkman series and the other could be another high end model above the NW-A50. While I have no hard evidence that one of those is the A50, we can go back to older models from the BT certs to see what they codes they had, if any. I do not have any others since this is all that was posted on the cert site. When comparing the BT cert and FCC certs, the ICX-1291 seems to match up with the NW-A50 certification (May 17 2018). But then there does not seem to be any audio products certified on the FCC around the 22nd of February, so perhaps again maybe this other audio player will be certified later on? Who knows, a mystery for now. There are a few more extra models with strange names on the cert as well. What these is unknown and only Sony knows what the codes mean. One is certified from early March 2018 and could be this ICX-1300 model, and the other from late May, A50 perhaps. One theory is that the BLE is Bluetooth low energy and one or two models are missing it (NoBLE) and the other, A50 perhaps has BLE. Of course this could all be wrong. 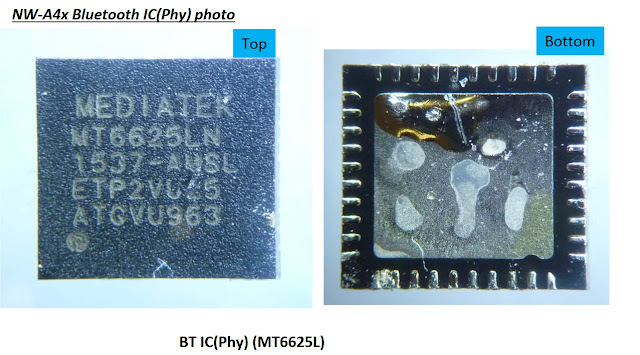 Finally the 6625 could be for the Mediatek MT6625ln chip? This is probably very likely, the A40 and I suspect A30, used this same chip. See below. All speculation, so here is hoping more information appears on the FCC or the BT cert site before IFA. Awesome! I'm excited to learn about a potential new higher end Walkman!!!! Thanks, Ascariss, for keeping us, Walkman fans, up to date with news about the series. Great job! No problem, hopefully these walkmans are for this year and not next year. Looking at the subset qualifications (108313,108315), both devices are capable of being a BT source & a sink (SRCSINK). Does this mean we're going to see Walkmans with Two-Way Bluetooth support? I really can't wait for this to happen! Source I understand, since sending audio to wireless speakers or headphones makes sense, but as a sink? Unless this is for sending file as well, but then copyright comes into play. There are DAPs (ex: Shanling M0) on the market that support being a sink device, which makes the DAP act like a BT speaker, receiving BT signal from Smartphones. My guessing is that it's a way to satisfy streaming demands without having to put a Wifi module in the device & custom build 3rd party streaming applications in the OS. It may well be so, but are there significant benefits to such an approach? It's surely an inferior alternative to wifi in terms of streaming capabilities... An I right? I hope the next walkman series will include Spotify or other streaming service. Weird, the DMP-Z1, NW-A55, NW-A5, NW-A57 are all up on the bluetooth cert page, yet the ICX-1291 & ICX-1300 remains a mystery. Sony just announced a ZX300G (ZX300 with 128GB memory) so it might be one of it, could the other one be the 40th anniversary walkman model? I was told these were not for this year but next year. Once sony adds the online help guide I can check to see what model it is.